We invite you to visit the other pages on our website to learn about Bacon & Thomas and the many services we provide. At Bacon & Thomas, our staff of attorneys and agents brings global vision to your intellectual property (“IP”) world. We have patent, trademark, and copyright experience coupled with a solid base of superior technical capabilities, effective communication skills, and in-depth knowledge of the U.S. patent, trademark, and copyright systems as well as IP systems outside the United States. We routinely work with both domestic and international entities, ranging from single innovators to large firms, requiring intellectual property services. Bacon & Thomas, PLLC, is a law firm that has focused solely on intellectual property law for over 75 years in the Washington, D.C., area. Our clients include domestic and foreign companies, universities, and individuals whom we represent before U.S. patent, trademark, and copyright offices; U.S. district and appellate courts; and foreign patent and trademark administrative agencies. Our experienced attorneys and agents are registered to practice by the U.S. Patent and Trademark Office and provide counsel and representation in the evaluation, protection, enforcement, and licensing of intellectual property spanning a wide spectrum of technologies in the mechanical, electrical, biotechnical, and chemical sciences and extending to modern business and information processing models. Our clientele particularly values our close presence to the U.S. Patent and Trademark Office and the familiarity our attorneys and agents have with regard to the intricacies of IP laws within the government agencies responsible for administering such laws and regulations. Many of our attorneys are former patent examiners who are familiar with internal Patent Office routines, and some previously worked in industry as engineers or scientists, where they gained valuable experience in product design and development processes. These are among the many factors that have contributed to the stability and success of Bacon & Thomas as a Washington, D.C.–area intellectual property law firm. Apart from preparation and prosecution of domestic and foreign patent and trademark applications, the firm’s services include offensive and defensive litigation, patent interferences, licensing, and transaction matters involving intellectual property legal issues. We are also experienced in evaluating patentability of ideas, conducting due diligence investigations, preparing opinions on patent and trademark infringement issues, and counseling clientele on domestic and foreign patent and trademark protection strategy. We maintain our communication technology up to the highest standards, which enables us both to communicate in a timely and efficient manner with our clients around the world and to utilize the electronic document filing and tracking services of the U.S. Patent and Trademark Office and the U.S. courts. For prospective clients, we welcome the opportunity to demonstrate how we can effectively represent your interests in the field of intellectual property law by bringing global vision to your IP world. 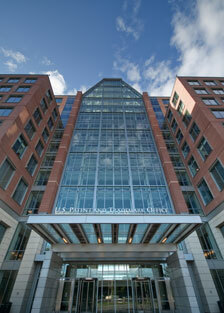 Bacon & Thomas is conveniently located near the Alexandria, Virginia headquarters of the United States Patent and Trademark Office.